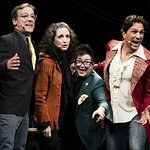 The 24 Hour Musicals is coming to Broadway for the first time. The marathon process for The 24 Hour Musicals begins at 9 PM the night before the performance. Writers, composers, directors, choreographers, actors, music directors, musicians and production staff — many of whom have never worked with or met each other before — gather for an orientation where they are asked to share one costume piece, one prop, a special skill, and to reveal something that they have always wanted to do on stage, as well as some singing and dancing. At 11 PM, the composers and writers get to work crafting 15-20 minute musicals overnight; at 9 AM the next morning, the actors receive their roles and the directors, choreographers and musicians arrive to begin rehearsal. Less than 12 hours later, they must be ready to perform in front of a live audience. The evening will benefit The Lillys’ work supporting women in theater and promoting gender parity, as well as The 24 Hour Plays’ programs, including The 24 Hour Plays: Nationals (a professional intensive for young artists). Featuring Performers: Corey Cott, Jackie Cruz, Lea DeLaria, Emily Estefan, Joel Marsh Garland, Savion Glover, Jessica Hecht, Carol Kane, Norm Lewis, Jose Llana, John Mulaney, Patti Murin, Bebe Neuwirth, Molly Ringwald, Jordan Roth, Jeremy Shamos, Will Swenson, Donald Webber, Jr; Directors: Carolyn Cantor, Kathleen Marshall, Robert O’Hara, Kate Whoriskey; Writers & Composers: Ashley Nicole Black, Kristen Childs, Jonathan Coulton, Amanda Green, Aimee Mann, Julia Mattison, Lauren Pritchard (LOLO), Jonathan Marc Sherman, Rona Siddiqui; Choreographers: Sarah O’Gleby, Rick and Jeff Kuperman; & Bandleader: Zac Zinger. Along with appearances by: Lynn Nottage, Lisa Kron, Kristen Anderson-Lopez, Todd London and Sarah Ruhl. Proceeds from the one-night-only performance benefit the Company’s program supporting theatre professionals 25 and under through The 24 Hour Plays: Nationals and The Lilly Awards Foundation’s work supporting women in theatre and promoting gender parity. www.24hourplays.com.